Two bedroom tri-level townhouse-style unit measuring 1069 square feet. On the upper level, you will find a living area with queen sleeper sofa and a full kitchen. On the middle level is a bedroom with 2 twin beds and a full bathroom. On the lower level is the master bedroom with king sized bed, and a full bathroom with a jacuzzi tub. The condo has a washer and dryer, gas fireplace, and deck with mountain views. Two bedroom lockoff units measure 1175 square feet. These 2BR units feature an “A or large 1BR side and a “B” or small 1BR side. The large 1BR “A” side provides 715 square feet, and features a bedroom with queen bed, a bathroom with a tub and shower and a separate room with jetted jacuzzi tub, a full kitchen, a living area with queen sofabed, and a patio or deck. The small 1BR “B” side provides 460 square feet, and features a bedroom with queen bed, a bathroom with a tub and shower, a full kitchen, a living area with queen sofabed. 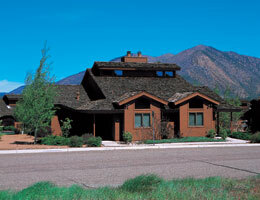 Please click here to see current availability, prices, payment options, photos and other information regarding Fairfield Wyndham Flagstaff Resort condo vacation rentals.